was assumed that greater mobility - i.e. greater speed - would give people access to more destinations. Roads were designed to encourage higher speeds which led to local destinations becoming less accessible. NJFIT helps to reverse this trend and increase accessibility by promoting a network of streets with slower speeds, multi-modal facilities and a higher concentration and mix of land uses. NJFIT supports the use of access management techniques to limit the number of driveways to enhance the safety and efficiency of local travel. 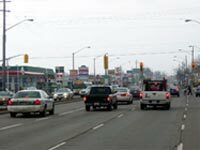 Typical suburban strip development results in congestion as frequent driveways slow down traffic. The location and frequency of access points will determine the type of development along a roadway. Frequent driveways encourage strip development all along the highway, encouraging car use and destroying scenic views from the road. Limiting the number and placement of entry points tend to promote compact development, which is more pedestrian and bicycle friendly, and more efficient for vehicular travel. A pedestrian-friendly downtown with a good mix of residential and commercial services gives resident's greater access to their daily destinations. A connected street network increases access by making routes more direct and travel choices more flexible.